Advertised for sale by The Tatler (January 29th 1936) as, ‘The finest value afloat’ for £2.400. VAGABOND was designed and built to order, with this particular ship bearing the number 1798, having been commissioned by one Captain Hubert Broad of Schneider Trophy (2nd place twice) and Gypsy Moth test pilot fame. Captain Broad’s personal specifications included a folding Pullman berth to starboard in the saloon, a large double berth for himself in the aft cabin with writing desk, dressing table and mirror, upholstered armchair and washbasin. He also had a bath fitted which required a fully baffled 300 gallon galvanised water tank in place of the standard 135 gal tank. It would appear that she was used as a floating weekday home and entertaining venue whilst Broad undertook his test flying from the Isle of Wight. Accompanying him was his factotum who resided in the forepeak. The Graham ‘Triton’ electric ‘butler’s summoning bell’ is still present and operational. At weekends VAGABOND provided transport to the mainland and Broad’s home in Hampshire. The outbreak of war saw VAGABOND move to the non-tidal reach of The Thames at Teddington where she appears to have continued to be used for accommodation, when Broad was working at Hawker Siddeley. From here she moved on several times with much work being undertaken to improve and maintain whilst preserving much of her Art Deco style. Many original features listed in the original Specification have survived such as the ‘Easy Veer’ anchor windlass on the foredeck, the Johnson patent ‘Quicktho’ sash windows, railway type drop windows with leather straps in the wheelhouse and Broad’s mirror lined cocktail cabinet in the wheelhouse. VAGABOND’s current owners aim to use her in the waters that she has occupied throughout her lifetime, with a view to operating her commercially in the future. 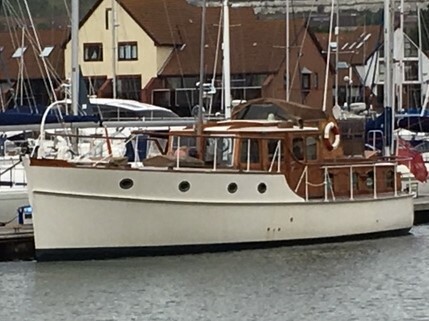 Vagabond had fallen into disrepair after years of use as a ‘house boat’ and was ashore at Dennett’s Boat Yard where she was found by her subsequent owners.